Here is last year's round-up in case you're looking for a lot of ideas. Molasses Snickerdoodles. These are cookies I've mentioned at least twice. I found the recipe last year and they are amazing. Flavorful, chewy perfection. Hershey's Kiss Cookies. I'm convinced that these cookies, warm from the oven, are one of the best things I've ever eaten. Which is why I continue to make them each year. Seriously...try them right off the hot pan. Peppermint Fudge. I make this every year. I store it in the freezer because I just think fudge tastes best that way. Addictive Spiced Nuts. The "addictive" part of this is no joke. HOLY cow. You will not be sorry. Or maybe you will. I packaged these up to send home in Christmas boxes. Peppermint Meltaways. I made these last night. They are very rich and tasty enough...very shortbread-like and a little crumbly. I don't know that I'd make them again, but they'd be good with tea. Sugar Cookies. I haven't made these in a few years; not since we've moved to Colorado. I don't even want to eat them. I just want to make them. It's therapeutic. Maybe I'll have a few. What kind of cookies are you making this week? So far, we've made Molasses cookies and sugar cookies--our traditional Andes mint-stuffed cookies are coming up on the menu for later this week. Christmas baking is a good kind of baking! So far I've made some molasses crinkles but they were crunchier than I wanted them to be, I like a soft cookie (I will have to try the molasses snickerdoodles!). I have everything on hand to make oatmeal m & m cookies, rocky road squares and Rice Krispie squares, because they never disappoint! Maybe you should make those sugar cookies and then send some to me. haha I was supposed to bake cookies last weekend with a friend of mine, but weather ruined our plans! I want to make my sugar cookies, but I just don't have the energy for the process. 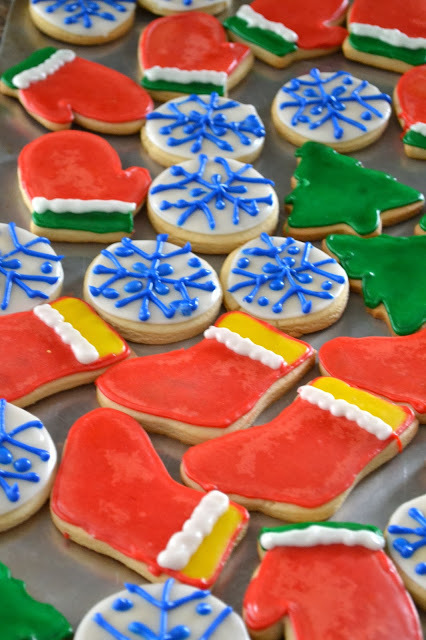 Check out my post today, you'll see our cookie exchange spread. We had (and still have) it all! Molasses snickerdoodles sound like my jam. I need to make these! Frozen fudge is the best!!! I store it the same way. I cheated and bought pre-made cookie dough. Then we decorated them. I also made my two ingredient cheat fudge. I want the experience without the effort this year. I just had a load of sugar cookies last night- they were amazing!!! None. I'm eating sugar and molasses from my mom. You're ambitious - all of these before Christmas? I'm the person that HATES making sugar cookies and/or gingerbread cookies. I hate rolling out dough, cutting it, re-rolling, cutting some more...and then having to decorate. I don't have the patience and I don't enjoy eating them. I like drop cookies. Scoop, drop, bake, done. I did make mixed nut brittle and molasses cookies this week, though, that I ended up overbaking so now they're gingersnaps...hehe. I made the hershey kiss cookies last night - my favorite way to eat them is a few minutes out of the freezer where they're cold, but not frozen. I'd love to just decorate sugar cookies. My mom and I went to a library event a week ago and we were given gingerbread men to decorate. I didn't eat any of them; I just liked the decoration part.